such a great combo, love the burgundy color on you. Great outfit!! :) Adore it. Such a great outfit, you look amazing. I def. LOVE your clutch!!!!!!!! I love this outfit!! The blouse is such a great color and I love your clutch!! Love this outfit - a bit of some boysih charm and style. The clutch is amazing to be honest. Lovely look. Love the hat and the blouse! The hat, the blazer, the clutch, i LOVED EVERYTHING!! i love the casualness of this outfit! yet it is very chic! Nice outfit, love the burgandy shirt and the clutch! You look amazing. I adore the color of your blouse and that clutch is adorable. 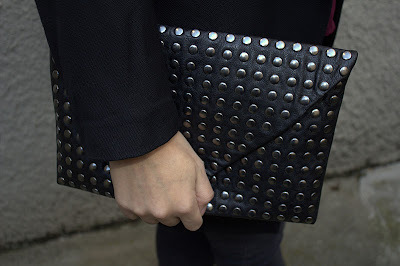 Beautiful outfit, i love this clutch. Nice outfit, I really like the colour of your shirt and I like that you kept the rest of the outfit black. Nice blog, I am now following. Really like your blog! I'm so going to follow you. Love this! Especially your boots and your clutch. love the clutch & outfit!! Hello :) Thanks for your comment! my new years resolution this year was to wear more styles of hats (i wear a fugly yellow green knit beanie basically every day....) and I REALLY hope i can find a version of the hat you are wearing, I just love it! Plus my roots are getting really bad and instead of going to the hairdresser id rather purchase new hats.